There are way too many "selfies" out there of people having breakfast, at their desks, sitting on the bus.....oh God I'm falling asleep just thinking about it! Just because you can.....(if you know what I mean). OK - I can see why Ellen did it for the Oscars. People wanted to share this photo on Twitter because it was, after all, the Academy Awards and it was entertaining for those of us (goofs) who stayed up for the show. Something to do while we waited for the good parts. 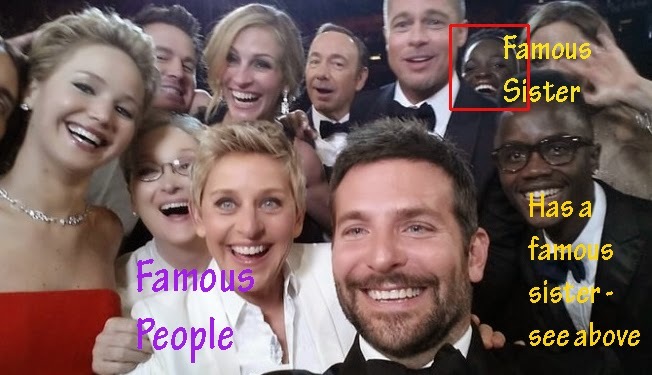 Good example of a "Selfie"
And see.....they all look good and well, famous. No eggs dripping from their chins or lint on their suits. (Although we all know the dresses, tuxes, and jewellery were on loan). Still. But this "selfie" business is getting out of hand. Waaaaaaay too many! Apparently, all these photos people are taking of themselves (for no apparent reason) is becoming a problem. I haven't looked up "Body Dysmorphic Disorder" yet but it can't be good can it? Anyway, I don't see what the big deal is. People have been doing this for yonks, even without smartphones. Selfies by Rembrandt, Renoir, Van Gogh and Picasso. The difference is (besides the obvious), the artists didn't send their faces to all their friends and their friends' friends because their friends and their friends' friends probably didn't want to see their faces first thing in the morning. I would love to see your selfies if you're standing beside the Queen, the Pope, an alien or anyone of similar interest. Also, count me in on your mailing list if your face shows up during an event similar to VE-Day, an Aznavour concert, anything Paris related or the Apocalypse. Any photo that includes only you with your arm stuck out just enough to crop the shot to your face at MacDonalds......no. I bet you're wondering why I was reading the International Business Times. Ha! Me too. Interesting connection of selfies to Rembrandt, Renoir, Van Gogh and Picasso....but so true. People have been recreating their own images for a long time. There has to be a link to narcissism though. I was recently reading about Van Gogh (why? I also don't know) and he had more than 30 self-portraits that have been attributed to him. There were probably many more that he painted over or trashed. Seems like a lot of effort to replicate one's image. If only he had a smart phone. The problem really comes from the fact that we spend so much time judging others. People today are reacting by trying hard to improve their "image". At universities they find that huge numbers cheat to make a "selfie of academic achievement" that they control. A huge industry has arisen to create counterfeit products so we can be seen with " cool " stuff. We have become so obsessed with our image that it became almost inevitable that we would share the images of the object we are so fascinated with, ourselves, once we started having a portable camera with us all the time.